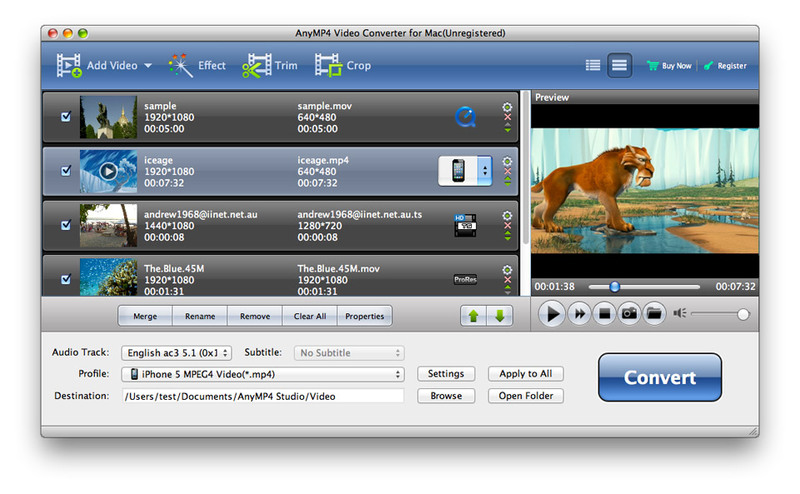 It's no doubt that this Video Converter for Mac is professional and versatile software which not only can convert any video to video formats on Mac like MOV, MPEG, MP4, WebM, M4V, WMV but also can extract audio tracks from videos to any popular audio format as you like so that you can also enjoy the movies and music on your portable devices, such as iPhone, iPod, iPad, Google Nexus, Samsung Galaxy S3, Galaxy Tab, Android phone, Windows phone and so on. What's more, you can edit the video with Trim, Crop, Merge and Watermark function. This versatile Mac Video Converter enables you to convert any video to all video formats on Mac, such as MOV, M4V, MP4, MPEG, AVI, WMV, 3GP, FLV, etc. Sometimes you just want to enjoy the audio part of the video. You can extract the audio tracks from the video then convert them to your desired format or the format compatible with your device, like MP3, FLAC, WAV, AAC, AC3, OGG, M4A and so on. With this powerful tool, you can convert videos to any portable devices, like iPod, iPhone, iPad, Google Nexus, Galaxy Tab, Galaxy Note 2, Nokia Lumia and more. You can enjoy the music whenever and wherever you go. Not satisfied with the brightness of the video? You're enabled to modify the video effect here. Besides Brightness, Contrast, Saturation, Hue and Volume are also modified with this powerful tool. You can get rid of your unwanted part of video and cut off the black edge of the video frame. Also the video frame is adjustable according to your needs. Here you can join several videos together so you can enjoy several videos in one file. This all-in-one software enables you to add text/image watermark in the video. You can add your signature or your favorite picture in the video. Here you can adjust the video settings like Encoder, Frame Rate, Resolution, Aspect Ratio and Video Bitrate. You can select your preferred one from the corresponding drop-down list. The audio settings including Encoder, Sample Rate, Channels and Audio Bitrate are also adjustable according to your desire. If the subtitle and audio track are optional, you can select the one you like best. Here you can specify the destination of Output Folder and Snapshot Folder and select the form of snapshot. 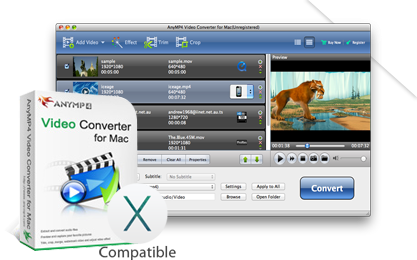 This best Mac Video Converter owns user-friendly interface so that it's very easy to operate. All the process will be finished by a few clicks. This powerful software has a built-in player which can let you see the source and target video at the same time. Also, you can take a snapshot of your favorite scene. With the newest accelerating technology, the converting speed is much faster than before. The conversion will be accomplished in a few seconds.